Oh, the classic Civic. Cars like these with body graphics, ridiculous aero, underglow, and ostentatious wheels are what gave rise to the demeaning hatred of “riced” cars in the community. I’m no Civic expert – having never owned one nor taken any in-depth interest in them – especially not the older generation cars like the EM1 (sixth gen) featured here. But I do recognize them as an iconic part of the car culture scene, which is why I decided to jump on another American kit; a departure from the usual JDM models. I didn’t have a bad experience with my latest Revell kit before this one, so I was willing to look past the wonky 1:25 scaling (most car models are 1:24) for a $15 model. This kit is technically part of Revell’s Fast and Furious lineup, even though as far as I can remember no such Civic appeared in the films. I thought at first that it was supposed to be evocative of the black Civics with green underglow that Dom’s crew used in the first film, but upon further examination it appears those cars were early 1993 EJ coupes, and had completely different body kits. So I guess this is just randomly branded under the Fast name then. The box itself also makes no mention of the films or even what year the car is; it’s just the Honda Civic Si Coupe. Flank vinyls were how you knew you had a kickass ride in the early 2000’s. The biohazard license plates are particularly humorous. I’m kind of surprised Revell bothered to include a carbon hood decal when none of the kits showcased on the boxart sported a carbon hood. Just when I was running low on mesh; this should be enough to last me 4 or 5 cars. In traditional Revell fashion, everything is given in plain white plastic sans the clear pieces and chrome parts. The main body looks fine and sturdy, with the bumpers included as separate parts. We get the option of a stock bumper set, molded Honda badge up front and all, or an aftermarket set. The aftermarket set isn’t outrageous – some more prominent lower garnishes on the rear and a badge/fog light delete on the front bumper seems pretty conservative. The side skirt extensions for the aftermarket build are also equally underwhelming. They’re basically just folded-over logs of plastic that attach to the rocker panels to bring them out a bit more aggressively. I was super not a fan of the mirror housings. You wouldn’t think any sort of mirror could look bad, but the stock housings just looked like a blob because they didn’t have any distinct edges. To be fair to Revell, this wasn’t their fault – the actual’s car’s mirrors really do look like that. Thankfully I have a near endless supply of spare mirrors laying around that can bolt on directly. I don’t even remember where this set came from, but it looks better than the stock units so that’s what counts. Also wasn’t a fan of the stock seats. They don’t look horrible, but I wanted to run something just a bit racier. I didn’t want to commit to actual buckets, even though I have a few spares on hand. Instead I figured it would be cleaner just to upgrade to nicer-looking street seats – in this case these are the stock units from my age-old S15 Silvia that I built forever ago. Two wing options are included – the stock bridge wing or a much more ostentatious and ridiculous looking piece of aero. I actually don’t think I would’ve minded running the crazier wing, but I wanted to go for a clean street look here, so I opted for the stock unit. Also important to remember that you have the option of running no wing, too. Revell was actually pretty smart about this – there are four indents on the underside of the trunk, two per wing mount. The manual instructs you to cut out whichever indent set based on which wing you want to run, so the spoilers actually have something to peg into on the trunk deck. End of the manual gives you a little layout of what the stock or “custom” versions of the car could look like. Naturally you have the freedom to mix and match the parts as you please, as I’m doing with the “custom” body kit and stock spoiler. Revell goes through the trouble of including cut-outs for the lower bumper vents but leaves the top grille molded. This wouldn’t do. Thankfully it was actually fairly easy to take it out with an exacto. We even get options with the motor. Headers or a standard exhaust manifold heat shield. Naturally open headers are just cooler. Steering column is a bit weird with how thick it is. Stock steering wheel was also very boring, so we’re swapping in the stock wheel from the Silvia. Pedals, e brake, shifter, center console armrest, and steering column all came as separate parts. Getting to work on the body. I was originally going to paint this car gloss black, but at the last minute decided I wanted a flashier color – a very specific look somewhat unique to the Honda community – J’s Racing Teal. I thought it would be a fitting and unique color for this Civic, but unfortunately there were no specific spray cans that matched that shade of metallic teal. My solution was then to combine the two colors that were closest: TS-41 Coral Blue and TS-54 Light Metallic Blue. Metallic colors are usually much thinner in how they go on than solid colors are, so my game plan was just to use the Coral Blue as a solid base coat with a thin coat of Light Metallic Blue on top. 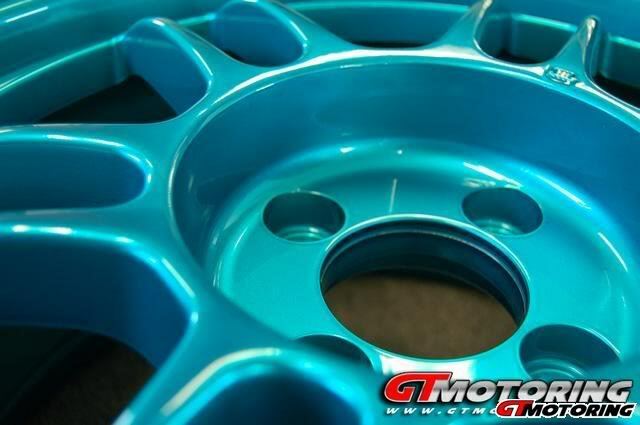 This would allow the minty hue of the Coral Blue to hopefully show through the metallic sparkle of the Light Metallic Blue. I have yet to work with realistic carbon fiber decals. In the past I ordered the cheapest sheet I found off of eBay (shown above) and found that it was little more than a mini checkerboard that wasn’t even the right color. With some modification I made it work with my FR-S hood, but now I’ve finally seen the true light. The “carbon” hood Revell gives you with this Civic (and also used on the Revell Eclipse I built previously) are arguably even worse. These “Composite Fiber” decals are fine to the point that they’re nearly black, but very notably sharp when viewed up close. The packaging for the stuff even boasts that all decals are not created equal, and that this “Composite Fiber” stuff is as realistic and fine as it’s going to get. Giving it a try on hood. It took a long time getting the decal on the FR-S’ hood to work properly without crinkles and cracks; this Civic hood is even worse, despite its seemingly simple design. It looks like a really simple job – just lay the decal over the hood and voila done right? Not so. Those raised bumps on the hood and how it narrows at the end around the headlights proved to be nightmares – decals generally don’t like going over compound curves without wrinkles and cracks. I didn’t have mark softer or any sort of decal solution that should make this process easier by conforming the decal around curves and edges, so in my attempt at forcing it on I broke a lot of it. Attempting to cover the broken bits with leftover decal also didn’t work very well. Fed up, I made the rash decision to attempt to cover up the broken decal mistakes by thinking clear coat would hide it. 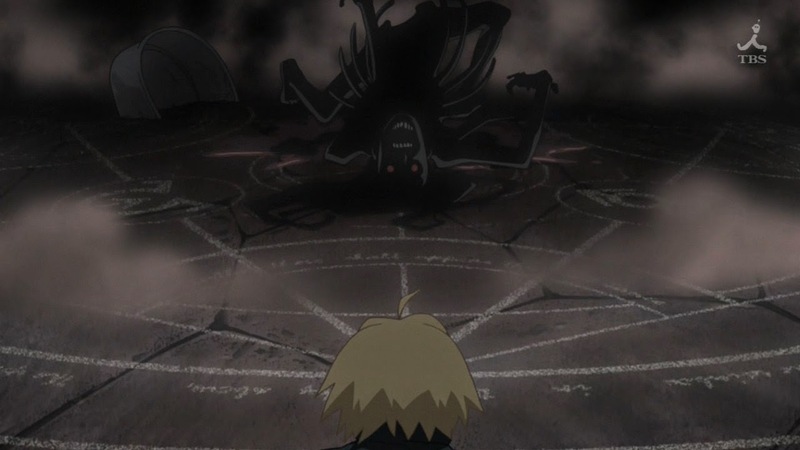 For whatever reason it ended up as a horrendous mess – failed human transmutations look prettier than this. I don’t know why the clear coat did this on top of the decal (I had dried it to ensure no moisture or air bubbles already) but I suspect it might just be incompatibility with the decal’s surface finish. Either way, I deemed the carbon attempt a complete no-go and threw the stuff into a vat of Purple Power, to strip the failures and start anew. The fallback now is to just paint the hood to match the body color. Bumpers were given the same paint treatment as the main body, though this ended up being my ultimate mistake. I really should’ve taped at least the bumpers to the car during painting. The delicate nature of maintaining a consistent shade of Light Metallic Blue meant that it was extremely difficult to match the final colors correctly if you didn’t paint it all at once. I suffered from this problem once before with my Rocket Bunny FR-S – I painted the widebody parts separately from the main body on that car with Deep Metallic Blue and they ended up as different shades. This is the first time I’ve had to actually dump the entire main body and bumpers into the Purple vat. I initially added another coat of Light Metallic Blue to the main body in an attempt to make the color darker to match with the bumpers, but it ended up being too dark. If I kept trying to paint match one set to another I’d eventually just get a thick gooey mess, so I thought it more practical to just strip it all and do it properly next time. While the body froths in the pit, I moved on with the rest of the car. These Revell kits are very generous with giving you customization options – you get three whole sets of chrome wheels to choose from. Like the Revell Eclipse I built before, these things are thin. Only one set of tires are included, and I ultimately decided I liked the thicker six-spoke aftermarket wheels the best. The thinner six spokes looked too much like a few wheels I already had on other cars, and the last set were Civic stockies. And of course, metal screws are included to attach the chassis to the body. They don’t go with the usual friction fits that Japanese kits commonly use. Little metal pins are also given as individual hub points for the wheels, so they’re able to spin and allow the car to roll. The rotors and brakes act as the middle of the sandwich. I’m still surprised chrome polished valve covers are a thing. The motor looks like little more than a chrome blob now, but it’ll have some drybrushing and painting later to break it up. The gauge cluster in the dash was very interesting – for some reason Revell gave you a little clear piece that fills in the cluster area, with a decal that’s supposed to go on it. The instructions mention specifically that you’re not actually supposed to apply the decal as a decal though – for some reason they want you to cut it out on the backing paper and glue it on as though it were just paper. I don’t know why they wouldn’t want the decal properly applied on the clear part, but I wasn’t going to question it. We also get a choice of an aftermarket orange cluster or the stock black one. I wasn’t a fan of the orange. Motor inserted into the chassis. I decided to drybrush the intake and exhaust manifolds with some gunmetal to mute the shiny chrome a bit – though I left the actual valve cover alone since that stuff’s supposed to be shiny. While I was at it I thought it would be neat to try drybrushing the undercarriage with the gunmetal to give it a realistic worn metal look. I actually really like the result – though I admit I think I went a little overboard. Next time if I ease it up a little I think it’d look perfect. Interior assembled. The red stripe and lettering on the motor is all one decal that slides over the chrome. Legend has it that polished valve covers helps VTEC kick in faster, yo. The window pane is one piece, with cutouts for the side door mirrors since these American kits like to have their windows “rolled down,” versus the fishbowl look Japanese kits prefer. Painted trim by hand with flat black acrylic. I think this is the first kit I’ve built with a sunroof too – clear T-tops don’t count. I decided that I definitely didn’t want the sunroof to be just clear – it for sure needed some tint. I figured while I was at it I might as well tint the rear quarters and rear windshield too. The purple bath didn’t work completely; it looks like it’s only good at stripping fresh layers. Stuff that’s dried for over 12 hours wasn’t coming off, so I cleaned it up as much as I could and primed it all white. This time I made sure to do it right by taping the front and rear bumpers on the inside so they all get painted with the body at once. I was going to just make the hood the same color as the rest of the body but then decided I would give the carbon another shot. I cut out the carbon hood decal that came with the kit and used that as a template to trace it out of the Composite Fiber stuff. Hopefully with an exact fit the wrinkles and crinkles will be more forgiving. I only decided to give this another shot because I talked to several model senpais at my local hobby shop about proper decal technique and picked up a bottle of Mark Fit while I was there. Apparently this stuff dissolves the clear film on decals and allows them to bend and flow around parts more easily, at the expense of making the decal incredibly delicate and prone to breakage. The key trick they mentioned was to basically heat-form the decal around bumps and compound curves with a hairdryer, which is exactly what I decided to try. Oh it’s beautiful. No cracks, no breaks, and just one hairline crinkle that I couldn’t quite get out. The Mark Fit seemed to help, but as far as I could tell the hairdryer was really the hero here. The decal seemed reluctant to fold down smoothly at first, but with a little more pulling and heat encouragement, it eventually seemed to stretch enough to go over the hood bumps smoothly. The next step is to make this work over vented hoods – an endeavor I don’t look forward to. And because the spray gloss didn’t work on the decal last time, I decided to go back to using the ‘ol tried and true Floor Care Finish. I generally don’t like this stuff because it’s hard to get an even shine around complex surfaces like a car body with many bulges and bends, but for something as simple as a hood it should do just fine. Taillights painted clear red and orange. A custom taillight option that resembled Altezzas were also given, but I opted for the stock units. The redone body color doesn’t look as good as I had hoped. The Light Metallic Blue went on just a bit too thick, covering up most of the Coral Blue, so it’s not quite the J’s Racing Teal I was going for. On the bright side the bumpers match the body perfectly now. For some reason the clear smoke always tends to leave unsightly specks when it sprays. I know this isn’t a result of dust or particles getting on the pieces when I spray; it seems to be an issue with the paint or can itself. As always though, it may look bad now but it’s nigh-unnoticeable when the car’s assembled. Body finally being screwed onto the chassis. I mentioned way at the beginning that I was just going to go with one of the stock wheel sets included in the kit, but after assembling it with those stick-skinny things I decided I didn’t like how narrow they were and how sunken in the body the wheels were. Unfortunately, I didn’t have a lot of spare wheel sets lying around – the one set that would fit the Civic was these – the horrible BBS Type RG’s that I was going to use on my DC5 but were too ugly to. On a whim I decided to try fitting them on the Civic just to see what would happen…and I like it! I mentioned during the DC5’s build that I thought it was a case of me just hating on the wheel design itself – but it turns out you just need it for the right car. It looked absolutely atrocious on the Integra but somehow fits with the Civic. The tires that came with the wheels looked a bit too fat for my liking on the Civic – so I swapped in a set of stretched tires from the Work Emotions I’ll be using on my upcoming STi. And of course, they can’t stay bronze/orange. At first I actually didn’t think that color combo looked bad, but thought that I might as well repaint them. The wheels were ironically a bit too wide to even fit in the Civic’s wheel wells properly, because they were hitting the suspension components. Cue makeshift spacer made out of a thick piece of pla plate. And because I thought the car looked too boring with just clear headlight lenses, I went with the classic Honda trend – clear yellow up front. I’ve seen this done on a lot of Civics before and I know it’s a polarizing look, but I thought it was a necessary spice for an otherwise somewhat bland Civic. When I first “finished” this kit, I was extremely unsatisfied. It looked super boring and out of place in the collection with the generic wheels from Revell. Turns out all it took was a new set of wheels and some modified headlights to turn it around. I really like the look now. 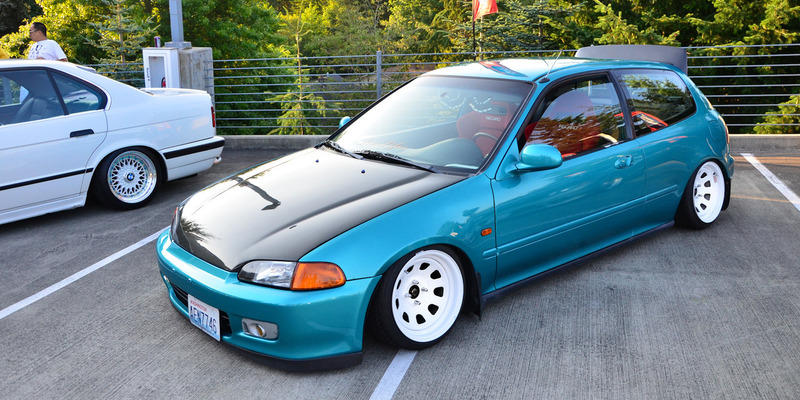 I think the lack of the crazy option wing and solid body with no graphics keeps it on the clean side, though I can certainly understand how no matter what, people will hate on it modified or not, because it’s a Honda. 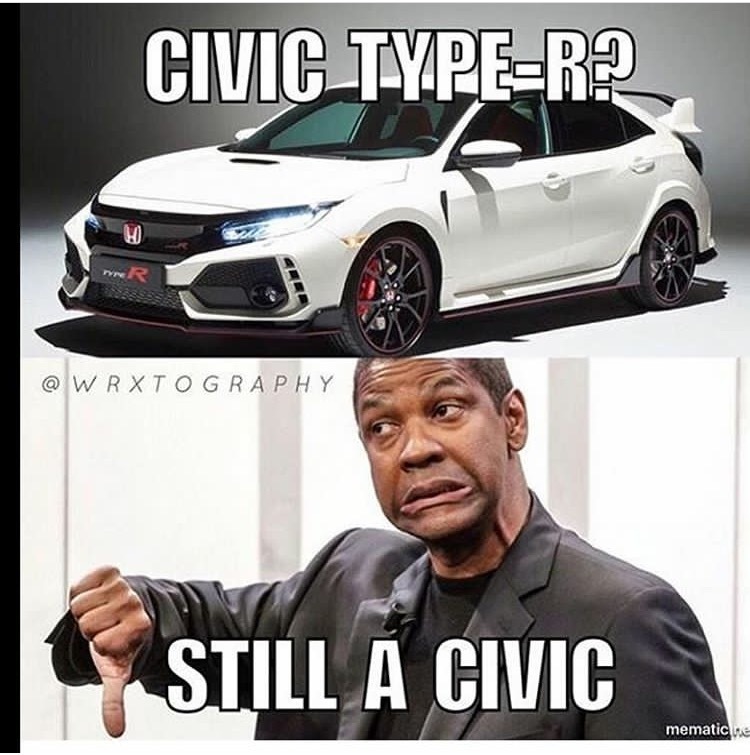 And it’s a Civic. I’m sad about not being able to achieve the J’s Racing Teal that I was going for, but at the end of the day I can live with the Light Metallic Blue. The bumpers are aftermarket, but they might as well be just slightly modified stock units, with how subtle they are. Veilside makes way more ostentatious stuff than this. I’m excited to try more complex carbon hoods in the future now that I know I can at least conform the stuff around basic compound curves, even though just getting this one right was a nightmare in its own right. I still don’t know how some modelers manage to get carbon patterns on crazy shapes like diffusers and steering wheels and such. Interior turned out pleasantly clean as well – Revell ended up including a surprising amount of decals for stuff like the climate controls and whatnot on the center stack. The S15 seats and steering wheel thankfully look right at home. Maybe I went just a tad overboard on the chassis drybrushing. Good on Revell for putting in the effort to almost always include a nicely detailed motor. Amusingly, they offer the option of stainless headers but only the stock airbox. Someone clearly has unorthodox performance mod priorities. The lovely 160hp B16 in this bay actually has quite a bit of nice detail – albeit a lot of it is admittedly molded onto stuff like the firewall and suspension towers, rather than actual separate pieces. Nothing some paint couldn’t bring out. Don’t do it – I betchu each one of ’em has at least 100 grand under the hood of their cars. Ironically this Civic turned out to be one of my favorite current kits, as polarizing as its body design language may be. I drew most of my inspiration from the classic stancenation’d look of many EG and EK Civic hatches like these, though of course it should be obvious by now that I’m not about that camber life. I really wish I got a better result with the body color, but I suppose that level of finesse will have to wait until I finally grow the balls for an airbrush. Hey do you sell this? If so how much for one blue Honda Civic Si ? I can do commissions to build your car or build it how you want, but it can be expensive. Unfortunately this specific model is part of my personal collection, so I am not selling it at this time.